We stock thousands of feet of Lambro non-insulated (model DAP) flexible duct! Non-insulated flexible duct is used for supply, return, exhaust, and any other application where an uninsulated flexible air connector is needed. 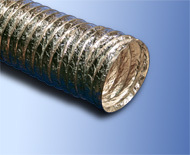 Model DAP - Air duct connector consisting of an aluminum foil-polyester laminated and a tough polyester film encapsulating a galvanized steel wire helix. No matter how big or how small your project is, we can be your one-stop flex shop! Lambro inc. is the largest manufacturer of flexible ducts in Quebec. Buy Canadian!